I thought I'd do a little Instagram post while I take a break from studying. I really can't get enough of that app; it's so easy to find the most amazing people on there. There are so many creative souls in this world. Have a lovely Sunday everyone! P.S. I kept getting sick once the weather took a tilt to the chilly, so I had to buy a pair of boots to protect my feet until I go back to Toronto. From there I will bring my fall shoes to Chicago & my warm coats. An unfortunate little blip in my challenge. Only 69 days left! Ooh I love the chain necklace! I've been looking for one ever since I saw the Celine version. I will check out liveloveshop, thank you! I agree about instagram, I spend way too much time on there. Aria- the necklace is bomb-diggity. I promise you'll love it. Liz- Dust off that cape, darling. I love ur floral pants!! love all the outfits!! 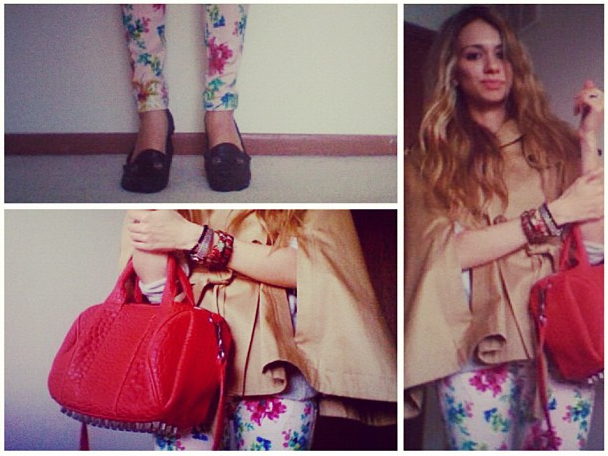 especially the floral leggings, you look gorgeous!